Brian Kelly is staying at Notre Dame. And that's great news for the Irish in the short term. Notre Dame is coming off a 12-0 regular season, a berth in the BCS Championship Game, has a lot of talented players coming back and what is currently the top-ranked recruiting class in the country coming in. Over the long term, it will be interesting to see how Kelly's interest in the Philadelphia Eagles sits with Irish fans. Coaches don't leave Notre Dame for other jobs. Notre Dame is a destination job. Or at very least, that's the way its fans will always think of it. You leave by retiring or firing. Not for the Philadelphia Eagles. "This week, I had an incredible opportunity to speak with one of the premier organizations in sports about becoming their head coach," said Kelly. "Like every kid who has ever put on a pair of football cleats, I have had thoughts about being a part of the NFL. However, after much reflection and conversation with those closest to me, I have decided to remain at Notre Dame. "This decision was motivated purely by my love for Notre Dame and the entire Fighting Irish community, the young men I have the great fortune to coach, and my desire to continue to build the best football program in the country. "We still have a lot of work to do and my staff and I are excited about the challenges ahead." It's no crime for Kelly to have serious thoughts about the NFL. Oregon's Chip Kelly did too, before staying with the Ducks. Most successful college coaches have to have those thoughts. It's just that Notre Dame has never been considered a stepping stone job. And Kelly, who left Cincinnati before a BCS bowl game to go to Notre Dame, might get a bit of a reputation as someone who has his eye on the next job. Look back at the quotes - he doesn't exactly seem to permanently close the door on going to the NFL. 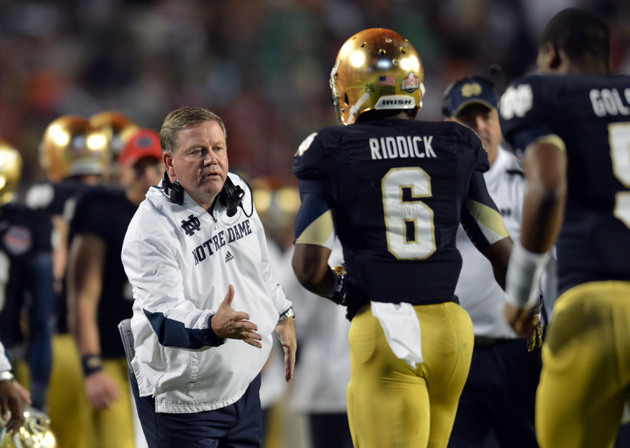 Notre Dame has to be wondering if it will have to worry Kelly talking to other teams in offseasons to come. Sure, he proclaimed his devotion to Notre Dame, but he also considered that the "best job in America" might not be as good as coaching in the NFL right after losing to Alabama. Kelly has done a tremendous job at Notre Dame, and has the pieces in place to remain a major player in the national title hunt for years to come, something the Irish hasn't been for almost two decades. There's just the question, is Kelly committed to Notre Dame, or is he committed to Notre Dame until he finds a different challenge?